Psychological projection or projection bias is a psychological defense mechanism where a person unconsciously denies his or her own attributes, thoughts, and emotions, which are then ascribed to the outside world, such as to other people. Thus, projection involves imagining or projecting the belief that others have those feelings. 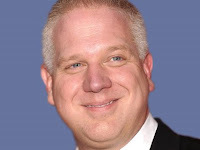 (1) Listen to this clip and consider whether Beck's uneducated commentary and violent rhetoric is not being projected onto Chris Matthews for the audacity Matthews showed by criticizing the error-prone Rep. Michelle Bachmann. Actually, this is just the latest example of projection noticed but the first one documented on this Review. Does this sound like an angry, dry-drunk projecting his faults and attibutes onto Matthews, or more like a rational political commentator making a case that Matthews is wrong about how the framers of the Constitution handled the problem of slavery? No matter who is correct in this argument, Beck does not come across as a mentally well person. Since Beck's followers are the ones who have attempted three, thwarted assassination attempts, this is clearly Beck projecting his attributes onto Matthews.